Because of its higher elevation at 4,633 feet, Sierra Vista boasts a milder climate than other cities of Southern Arizona, like Tucson and Phoenix. While summers do still get hot, the climate sustains more lush foliage than you might expect to see in the desert. Yet the winters are still relatively mild—apart from some recent unexpected snowfall—which means that maintaining a backyard garden is practical and easy for local homeowners. If you’re looking to get a garden started on your Sierra Vista property, spring is the perfect season to get started. This article will guide you through some important tips and reminders for gardening success in the high desert. The spring planting season is ideal for beginning gardeners, because it is less tricky than fall planting, since you don’t have to worry about winter frosts. However, there can still be some chilly nights through the spring, so you do need to carefully consider when to plant directly in the ground or transfer seeds from indoor pots. Some crops will do best when you plant directly outdoors, and those will usually have a range of late February to early May for planting times. Plants that should go directly in the ground by March include potatoes, peas, carrots, and beets. Plants such as asparagus, beans, melons, and radishes will do better with later planting in late March, April, and early May. Plants in mustard family, otherwise known as Cole crops, should be started with indoor seeds and then transferred to the outdoor garden around April 9th. The same rules apply to lettuce, chard, and other leafy greens, as these plants are more susceptible to frost damage and hard freezes. Finally, tomatoes, peppers, and eggplants will all do best with indoor seedlings that are transferred to the ground around April 25th, or as soon as there is a consistent no-frost forecast. One of the biggest obstacles to contend with as an Arizona gardener is the soil. Arizona soil is rich in clay, which is not nutrient-dense and often causes iron and nitrogen deficiencies in plants. Additionally, you may reach a layer of caliche as you dig in your backyard. This layer of the subsoil is hard-packed clay that is almost impossible to dig through with a shovel. So, you will almost always need to add top soil when planting in Sierra Vista, and it may be beneficial to utilize raised beds or large pots rather than digging into the ground to plant. 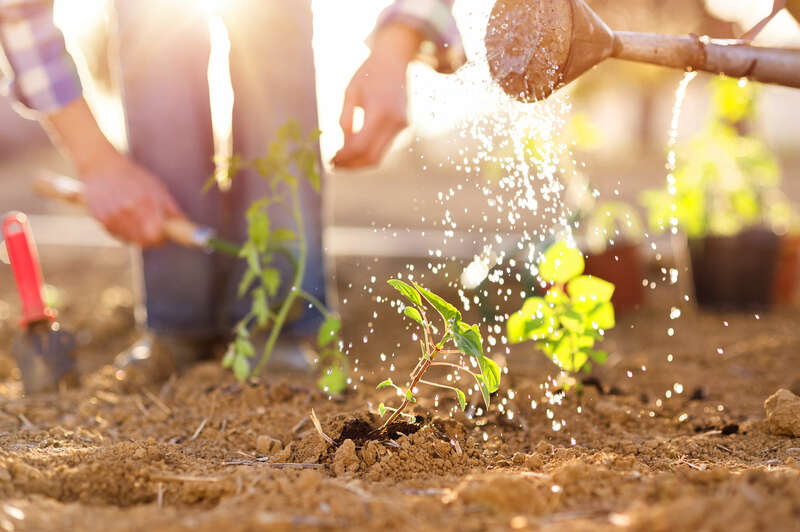 As you prepare soil outdoors, you will want to pay attention to how the sun hits your yard at various times of the day, so you know what will be best planted in different locations. Some plants will thrive in total sun, but many will need some hours of shade throughout the day, especially as the longer days of spring and summer arrive. Watering is another big concern for Arizona gardeners. If you are planning to grow a larger garden, an irrigation system may be a necessity. Drip irrigation systems can ensure that plants are watered at the right time daily, so water is not lost to evaporation and the soil remains rich and flexible. Without a timed irrigation system, you should water deeply first thing in the morning and check soil for dryness in the late afternoon. While there are some plants that are best with seeds and starts planted directly in the ground, others will benefit from indoor starters. Plants like tomatoes and eggplant require being started indoors, but broccoli and Brussels sprouts can optionally be started outdoors. Planting seeds indoors to transfer later will reduce losses to late spring frosts and ensure healthier plants throughout the growing season. When you start to see seedlings emerge from indoor starts, they should be placed in a bright area of the house, where they can rest undisturbed and be easily watered until they are ready for transfer. At your Castle & Cooke home in Arizona, you will have ample yard space to start a garden of your own, and you can enjoy the custom amenities that come with a built-to-order home. To learn more about our developments in Southern Arizona, visit our website or give us a call at (520) 378-5110.